Rudolph Schildkraut (1864-1930) was born in the city of Constantinople, Turkey, It was by being a part of the many Germany repertory companies in Europe that he was able to finely hone his acting skills. He became especially well-known as an actor after performing in Berlin, Germany with the acting troupe of Max Reinhardt.
" In his reserve, his simplicity, his art of 'underplaying,'...he was twenty years ahead of his time...he was timeless as the character he created and as all great art is, defying classification and transcending the confines of style and school; naturalist in his minute observation of detail, classicist in his respect for form, expressionist in his relentless drive for the essential, ultramodern in his search for the hidden truth behind the facade of sham and illusion...None of his creations could be reduced to a formula, for he presented within each character in all its complexity and inconsistency." 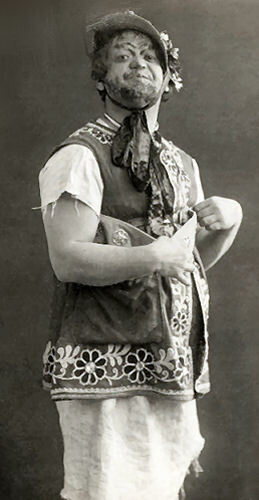 Schildkraut also acted on Broadway as well as in both German and American films in the 1920s. Text adapted from "The Yiddish Theatre in America," by David S. Lifson, 1965.